Kuuka is a low-population world with a population of less than 10,000 sophonts in size. The planet has a surface gravity of 0.31 Gs and 0.6 atmospheres of air pressure. The molten iron core yields a density of 4.58 g/ml. The climate is very cold, as the planet orbits 1.79 AU from its primary. There are twelve planets in this system, this number includes the two gas giants and the two asteroid belts. Large continental land masses are criss-crossed by massive mountain ranges. Thick glaciers and snows are piled everywhere on the cold, vacant world. Quiet and frozen, only the occasional roar of a war machine or animal cry breaks the silence of this grave strewn landscape. There are several invasive species here that were imported with the terraforming and colonization projects. These forms have mutated and evolved over time. Now that the pressures from the warring nations are gone several species are making a come back and their numbers are rising. There are several areas still radioactive, some dead zones are due to chemical and biological weapon strikes. These are still being surveyed and marked by the scouts chartered with resurveying the world and determining what is required to reintroduce colonists and how soon will recovery be possible. There are several native lifeforms as well. Originally colonized by Vilani under a corporate charter from the First Imperium under the direction of the Naasirka Megacorporation. Kuuka, as a member world of the Third Imperium has a member of the Imperial Nobility overseeing the world. It holds the estate of an Imperial knight. This knight is a young, recent arrival. He officially left the scout service, but now "supervises" operations on behalf of the emperor via his local proxy the subsector duke. Kuuka has a poor quality starport. Starports of this class very rarely have both a Lowport and a Highport. The scout recovery teams refer to this orbital complex as the flotilla. They use heavily armored shuttles with extensive ECM to visit the surface. Most teams use a scout version of battledress to resist environmental hazards, NBC and weapons fire from native war machines. Kuuka possesses a Technology Level of TL–7. Kuuka has a Balkanized government. This planet became an unintended lab for a strange form of warfare. The original populations within all the different nation states were completely wiped out twenty years ago. No one knows what started the last war. No one survived. The current population are Imperial Interstellar Scout Service personnel, and imperial contractors brought in to maintain a large, primitive space station. A mass of abandoned orbital fortresses have been grafted together to form an orbital high port. The facilities are considered equivalent to a class D port. The war fighting command and control functions were all highly automated. Each of the world's nations had vast underground fortress complexes and factory facilities. Apparently an AI virus of sorts seized control of the networks. All the inhabitants of the world are dead. The orbital residents avoid the surface. It is too dangerous to linger on the ground. This AI is of artificial origin, of high technology and introduced from beyond this world. Advanced robotics and automation were built into all military equipment. Not true drones, in the TL–13 sense, but the presence of TL–7 battle computers, autopilots and master/slave rigs built into all military vehicles. As a result, thirteen different warlord personalities emerged. Each AI fragment thinks it represents one of the original countries. Each aspect has its own personality and is trying to defeat the others. 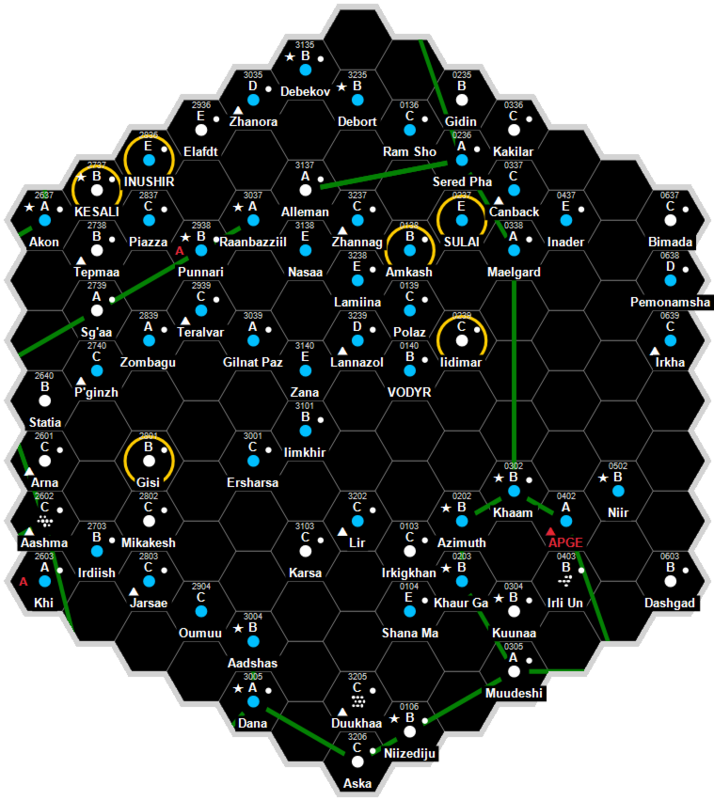 Alliances shift and front lines move as they continue to wage war without human direction. Now twenty years latter the wear and tear on the equipment shows. Most command and control bunkers had human hive minds wired into the system with advanced life support machinery. Most of these have gone insane. Orders are still issued, missions are still mounted. Most of these TL–7 vehicles carry human remains with their entombed, dead crews still at the controls. Their vehicles are fighting on without their input, in "automatic" mode. Bombers are launched, fighters scramble, platoons of battered tanks slug it out. Reserves and raw materials are running out. Observers are wondering how long these crude systems can keep it up. The frequency of operations have decreased. Most "key" targets are long gone. Some are still rebombed, and reattacked just to make sure. Machines can get into a rut. Scout observers have to be careful not to misidentified as new forces from an enemy nation, lest they be targeted. This is why a permanent presence on the ground is deemed impractical at this time. So many sleeper weapons are still waiting in their silos, linked to tripwire sensors. Anything entering their zone of control is subject to attack. Mines are everywhere. The 37th Automatic Air Army, for example, flies the War Master Bomber. The orbital community provides services for travelers and the scouts posted here. Naasirka is a major investor and seems to be underwriting much of the expenses for these efforts. The orbital community is largely cut off from planetary resources. Limited visits are possible without triggering attacks from the undead war machines. The small population base preclude local manufacturing, ironically some can scavenge equipment stockpiled by the nearly exhausted combatant war machines. The residents were of extremely old Vilani descent. They are all dead now. Thirteen discrete industrial war machines continue to wage a futile, pointless war. They use their simple programmed instructions to implement what they were last told to do, wipe out all enemies. No one remains to turn them off. Vast cityscapes lie vacant across each continent. Bombed out and lifeless, wild, wind swept and silent. Many of the records explaining what happened are lost in the ruins from this last suicidal conflict. The alien intellect responsible for catalyzing and enabling this tragic experiment has not officially stepped forward to take credit. The last living combatants died out at least twenty years ago. This page was last modified on 31 July 2017, at 12:49.